Pugs once jaunted around the palaces and lounged on the laps of ancient Chinese royals. And this is exactly what they’ll do—with relish—in your home. If you happen to be relaxing on the couch, your Pug will rest happily join you. But they are far from lazy. Pugs are alert and attentive, following their owners from room to room and always ready to play. Pugs seem to get along with anybody—especially those that give them lots of attention. They love being cuddled and petted so much that they can get jealous or troubled when your affections are devoted to someone else. Most Pugs get along with children well, being patient and always ready to play games. Either way, they love being around people and would rather have your company than be left alone. On that note, they are curious and intelligent enough to get into mischief around the house or yard. Good watchdogs with a healthy bark—not yappy—Pugs also happen to be very charming hosts. They will greet usually your guests with a prompt and perky welcome. 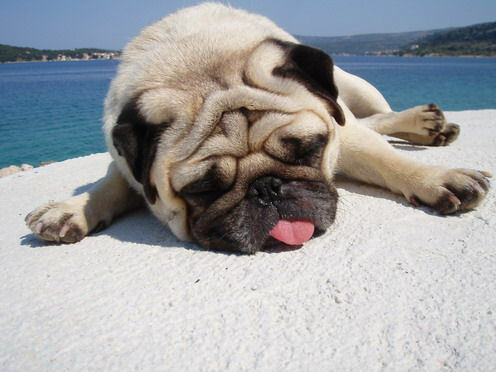 Because they have a flat muzzle, Pugs tend to snort, snore and wheeze when fluid gets caught under their palate. These situations usually sort themselves out. Their wrinkles need to be cleaned regularly, since they gather debris. Pugs like an ambient temperature. In cold weather, they can quickly catch colds. In hot weather, they can overheat and die. Air-conditioning is recommended. They will do perfectly fine in an apartment, not needing a yard or lots of room to be happy. Make sure to ration their food and give them plenty of exercise or they will become obese, causing a shorter lifespan and other health problems. Pugs are dignified animals and expect to be treated that way. Angry words or severe training could hurt their feelings. Pugs have murky and mysterious origins. While everyone agrees that this is one of the world’s oldest breeds, no one is sure exactly how old. Some claim that Pugs were shorthaired version of Pekingese and fixtures among royals in the Shang Dynasty (1600-1046 B.C. ), while others say they’re actually a small kind of French Mastiff or Bulldog. Today, most authorities agree that the Pug originated in China as early as 400 B.C. The name “Pug” is also mysterious. It could either come from a pet name for marmoset monkeys or from the Latin pugnus, or “fist.” Many Pugs were brought to Europe after the British invaded China in 1860. They received AKC status in 1885 and have been popular dogs in America ever since. You definitely know a Pug when you see one. Pugs have a short, stocky, “cobby” frame, a round head with a flat muzzle and round, dark, bulging eyes. Their wrinkled brows give them a kind of concerned expression, and they have velvety dark ears that fold down. They have straight, long limbs, giving them a sprightly step, plus a single- or double-curled tail at the end. Pugs have a smooth, soft coat that comes in black, silver, fawn and apricot.